Its All About the BLACK TANK! You would think we would have better things to discuss with the holidays approaching and time spent now daydreaming (or really planning) for our 2018 Avion Adventures! But honestly, with our Pewter Palace in winter storage, it seems like a good time to discuss those not so popular things like….black tanks and sewer smells! We are fortunate in that our 1973 Avion has both a grey water and black water tank. Up to and through 1972 Avions were built with only one discharge tank (held black and grey combined). yikes! That would not do for us at all–Especially once we start full timing. These tanks, when our rigs were built were not the size that most modern trailers are. In fact, our grey water is 25 gallons and our black is also 25 gallons. Through our experience, we pretty much can get a little over a week with our grey water (assuming no showers – we use the campgrounds shower, and not dumping dish water on the ground outside rather than down the drain). We can get about 5-7 days with black water tank, again, depends on if we are spending most of the day away from camp either siteseeing or going to work. Lets remember, that up to that point (1972) these rigs were totally produced for the leisure market and living full time in them was virtually inconceivable. Were there some full timers in the 70’s? I suspect so, but nothing like the ever increasing rage and trends that are going on now. The internet has certainly made it all so much easier and seamless-even for those who telecommute now for work. Full Time living on an RV is really quite simple and easy. Also, I would bet that most travel trailer campers also were using private or public campgrounds that at least had some hook ups with at minimum, dump stations. We still see a considerable amount of campgrounds, especially those in more rural locations having just electric and water intake available at the actual site you have, and then you have to drive to the dump station to empty your black/grey water. The NY State Campground we were at this summer for the Tin Can Tourist NE Rally (Sampson State Park, nice place!) had water and electric at our site, but a communal dump station area for discharge. Many, many state and national campgrounds and parks are still this way. Lets face it, the cost for putting separate lines to a campground with over 200 sites would be outrageous in today’s costs. So back to the original intention of my blog post. Black water…..how to manage it as efficiently as possible with NO smells. When we had our 1998 Class A Itasca Motor home, we constantly had issues with “smells” which were sewer gases leaking from (I guess) improperly constructed vent tanks. it seemed more prevalent when we were on the road down the highway but none the less, we still could “smell” when we had to dump. We tried a variety of toilet treatment chemicals purchased at a variety of camp and RV stores…all supposed to offer the best in waste breakdown and prevention of smells. We tried the gadget on top of the roof that was a directional rotating wing type cap that was supposed to help. I guess the swivel vent did help a little. But guess what…back in 1973 the engineers of the Avion’s knew what they were doing. To date, we have NEVER had any of those smells in our Avion! And remember, we just got done living in her for three and a half months full time, stationary. We have the vintage, standard fixed cap on the vent pipe that comes up thru the roof. Yes, we do have a more modern (but still plastic) toilet but the fact that the black water holding tank is directly below the toilet I think helps to prevent issues. You literally can “see” when your tank is getting filled…ok, not a great site to behold- but a good check and balance anyway. A photo of our 1973 Avion LaGrande, 28 foot bathroom. What you cannot see is the tub/shower and two very spacious storage closets in addition to the under counter storage. Our rig came with a bunch of the traditional and well recognized brands of other digesters, but i really wanted something different to avoid past issues. In doing research and with checking LOTS of reviews on Amazon, this one consistently rose to the top…pardon the pun. This stuff is so eco-friendly too! (My daughter would hopefully even approve!) Reviews note that Unique RV Digester is also proven to “unstop clogs, dried out and caked on gunk”. Glad we did not have that issue…but truly, we see lots of posts on RV FB chat sites where especially vintage RVs have sat for so long unattended that their sewer systems have to be pretty yucky. Supposedly, if you load your tank with the prescribed amount of this stuff….let it sit, then take your rig on the road for a little hula dancing down the road this stuff will unshake and degrade the sludge and make it possible to drain and start reusing your system effectively again. There were many testimonials to this effect on Amazon and honestly, I was quite impressed reading them. Many Avion owners (and other vintage trailer owners for that matter) have realized the fact that well…those “monitor panels” really do not work well or at all after decades. The sensors they use on even more modern units to signal when your tanks are getting full leave much to be desired. In fact, their lousy. Unique RV Digester, in some cases has even proven itself to clean the detectors and get those lights working again. That did not happen to us…but no problem…like i said–we can give it an “eye spy” and see when our black water/sewer tank is gonna need an emptying. Nothing like an eye witness right?? What I can tell you is that the Unique RV Digester solution has worked beautifully for us. We have NO Smells, No clogs, and everything drains beautifully. We did follow the initial start up instructions and for the rest of the season were on the “maintenance” dosage after each dump. We also put a little in our grey water too, just to help breakdown any food particles and grease that may have slipped down when doing dishes. 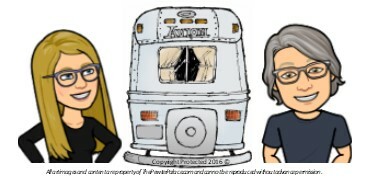 An added funny….you know part of what we love about RV camping is meeting other folks, sitting around a communal campfire and sharing stories, jokes and fun times. Well, wouldn’t you know, when we were at the Silver Avion Fellowship Rally this summer in Elkhart Indiana the conversation turned to RV Black Tanks. (Don’t ask how we got there!!) but lo and behold, a fellow Avioner mentioned this same UNIQUE RV Digester with the same gusto and recommendation we had. He also has been a long timer and it was great for Kevin and I to hear others have had such success and recommend it too. So armed with this first season going so well, we have stocked up on our Unique RV Digester and are ready for smell free travels! Hope this blog post helps fellow Trailer and motorhome owners too. If you want to order this stuff…here is an Amazon link. They do track you down and the company will offer you coupons for future purchases. Read about their company, they are pretty cool too! If you see us on the road…beep, wave and say HI! !